I have built my reputation in the industry based on my attentiveness to the artists needs as well as having a unique tone and an ability to manipulate different styles. Most producers I work with know what to expect from me as a bass player. I do not force my own personal taste unless I am asked to go for it. I prefer to marry my sound to what the producer hears or has charted out. Nothing compares to being with an artist in the studio during a recording session. Unfortunately it isn't always so easy to coordinate everyone at the same time during a deadline. 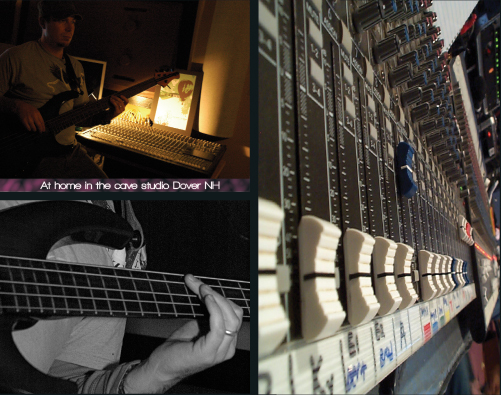 With the help of today's technology I can do a bass session for an artist in Dubai from my house in Dover, NH. I can import the majority of today's top recording platforms into my studio, record my bass part and then send the file back to the artist. While I prefer to be face to face with the producer, this method has proven to be very effective for me and is considered an industry standard.